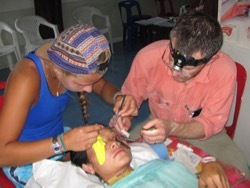 Bob and Elle Arnold joined FBR translator Dhee, FBR coordinator Jeff Wheaton and the Tronsrues- George, Jordy and David, and picked up Eye Medic NayHser in MaeSot arriving in Bung Klung May 13th. 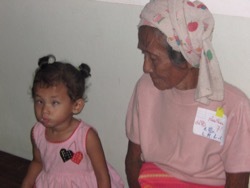 With EhKloMu and SueBoo, screening clinic for cross border patients (134) held with 43 receiving surgery for cataract, glaucoma, chalazia and strabismus. Local Karen medics screened patients, assisted surgery, maintained the generator, sterilized instruments and demonstrated outstanding hospitality. 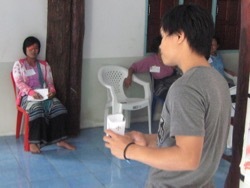 Elle and Dhee joining Taew in the Thai school to teach english to 500 students. 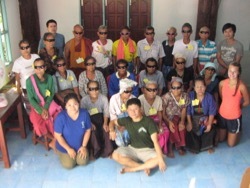 Alcon's donation of materials for 48 cataract procedures greatly appreciated. 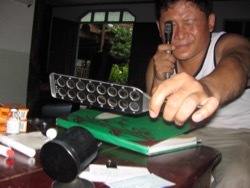 Over 80 pairs of spectacles dispensed: readers, Burma bifocals and custom spectacles.